A really comfortable home-from-home in a very special and tranquil spot. The antidote to frantic – spectacular countryside views, big skies, glorious beaches and wildlife watching await! Perfectly equipped with very thoughtful attention to all the little details, including a warm welcome and fantastic welcome hamper. A fantastic little getaway at any time of the year with a minimum of 2 nights’ stay. Situated on the Weavers Way, a network of footpaths and quiet lanes lead to some delightful discoveries for walkers, bird watchers and cyclists – cycle hire is available. A four minute stroll takes you to an excellent pub, The Erpingham Arms, with fine ales and good quality food. 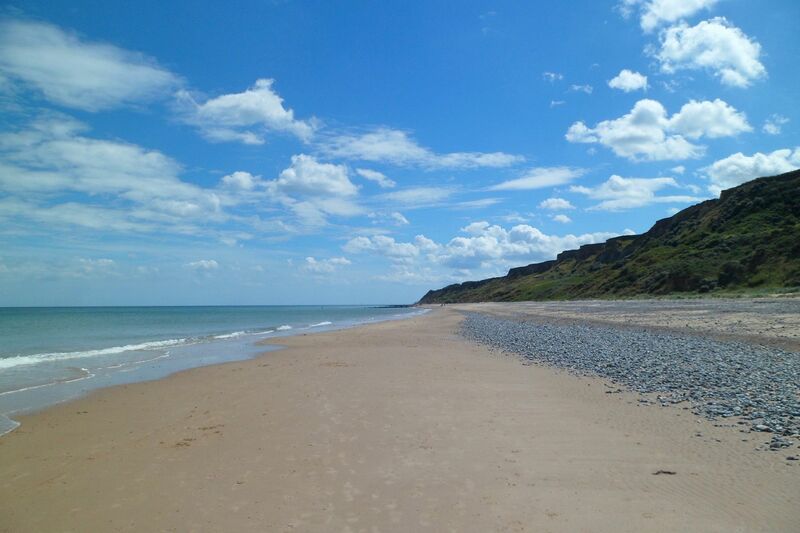 The sandy beaches and magical coastal walks along the North Norfolk coast are a short drive away with Cromer and Sheringham within a 20 minute drive. Enjoy the delights of Felbrigg, Blickling and the delightful gardens at East Ruston, Old Vicarage. There is a swimming pool, sauna and jacuzzi a short walk away available for private hire (contact Skipjack Leisure on 01263 761352), as well as riding stables. Alby Crafts is a very good craft centre just outside the village. The village has a multi use games area with tennis court available to hire. Tennis rackets are available from the housekeeper. Weavers Loft is accessed via an external staircase which leads onto the balcony area. Open plan living space with sitting area furnished with comfortable seating and a kitchen/dining area. Bedroom with a 6′ bed (which can be 2 x 3′ beds) and en suite shower room. Enjoy beautiful countryside views from the large balcony with comfortable seating and a table. Within a spectacular wildlife environment, watch the cows come and go, make friends with the hens and Oscar the cat. You may be lucky enough to spot deer and a pair of barn owls who are also regular visitors! There is also a shared garden and access to adjacent woodland. Style, comfort and attention to detail best describes Weavers Loft. 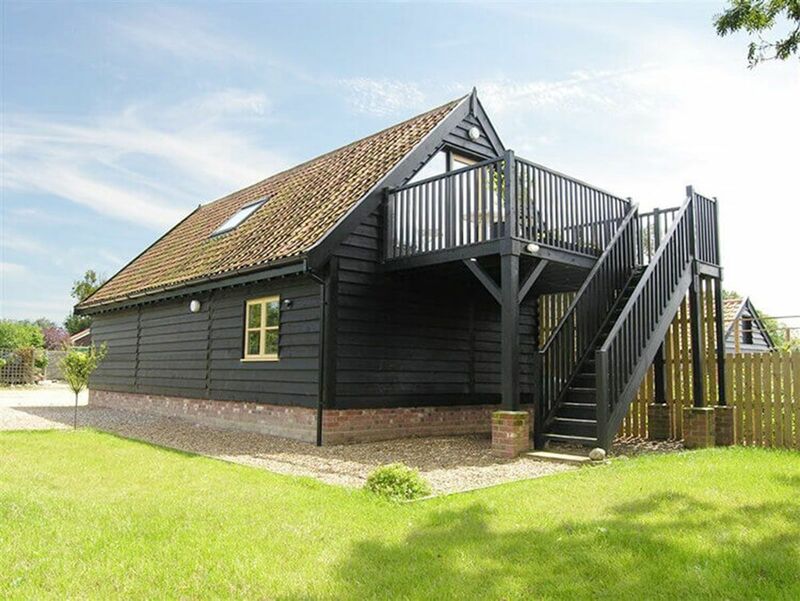 Sleeping two in open plan loft living, you’ll be snug as a bug in pure rural bliss. Recently converted and flooded with sunlight from the full height glazing, our idyllic bolthole is very attractively furnished. Weavers Loft affords wonderful far-reaching views of unspoilt North Norfolk countryside from its private balcony…only wildlife disturbs the silence, with frequent sightings of the resident barn owls and deer. The open plan living space is designed for comfort. A wonderful corner sofa helps make you feel at home and the digital television has a built in DVD for movie nights. There is also an iPod dock and WiFi. The kitchen area has all the appliances you expect and everything else you might need. The bedroom is accessed off the main living area and has a sumptuous 6’ superking which promotes deep sleeps and an en suite shower. Wake to unending views and croissants on the decked balcony. Weavers Loft is a great place to relax – hear the sound of silence and discover the invigorating power of pure peace. Aptly named, Weavers Loft is situated on the Weavers’ Way footpath, perfect for walking, wildlife watching and cycling with bicycle hire and great routes on the doorstep. Set in the owner’s woodland garden in the tranquil rural village of Erpingham, North Norfolk, Weavers Loft is within easy reach of Cromer and the North Norfolk Coast, yet only 15 miles from fine cathedral city of Norwich. The market town of Aylsham, less than three miles, is served by good shopping facilities, restaurants and a regular farmers’ market. Enjoy the delights of many fine National Trust properties nearby, including Blickling Hall which hosts open air concerts throughout the summer months and year-round events, Felbrigg Hall with its stunning gardens and Sheringham Park with its many species of trees and way marked walks. At Wroxham, the ‘Capital of the Broads’, daily boat hire is available to explore the famous waterways. For a change of tempo, the city of Norwich, one of England’s finest shopping centres, boasts a Norman Cathedral and Castle, theatres and museums. Numerous bird sanctuaries, salt marshes and wildlife centres punctuate the region. The popular Georgian towns of Holt and Burnham Market, with their boutiques and antique shops and the beach at Holkham are all within easy reach. A variety of good restaurants and country pubs are located close by including The Erpingham Arms with its real ale within walking distance. The acclaimed Saracens Head is nearby and the award-winning Gunton Arms just a short drive away. Aylsham also has a weekly Friday morning W.I. market with fresh local produce available and a twice monthly Saturday morning farmers market. There is an indoor heated swimming pool, sauna and jacuzzi 16 minutes’ walk away which is available for private hire. For further details contact Skipjack Leisure on 01263 761352. The Norfolk Broads are all which is great for those who enjoy boating, fishing and the beauty of the waterways. Hire a day-boat on the Norfolk Broads – try Wroxham (14.5 miles), Stalham (16 miles) or Potter Heigham. The North East corner of the Norfolk Broads are equally remote as many boats cannot navigate through Potter Heigham bridge to get here! 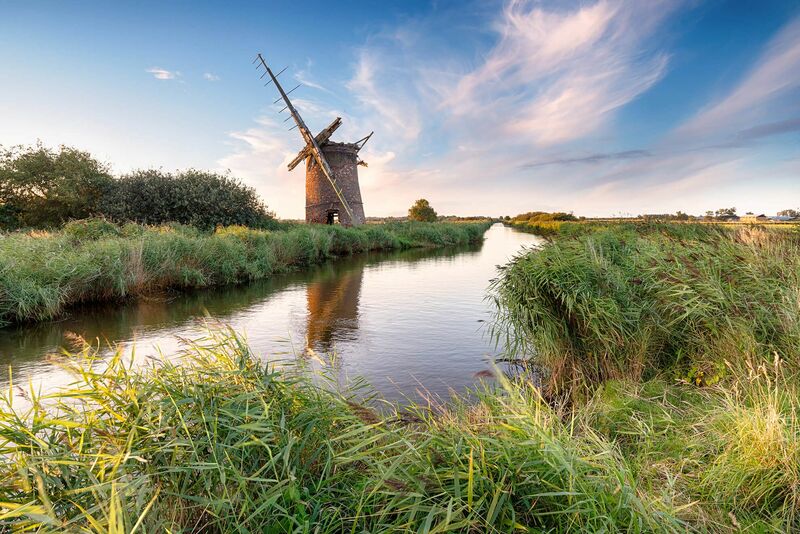 However, this corner of the Broads contain some real treasures, such as the Horsey Windpump at Horsey (23 miles) and the villages of Hickling (20 miles), Martham (23.5 miles) and West Somerton(25 miles). NWT Cockshoot Broad (17 miles). How Hill National Nature Reserve, near Ludham (19 miles), features the “Electric Eel” electric passenger boat on which visitors can take a trip through the maze of reed-fringed dykes, normally not accessible to the public. From Easter to the end of October, the Broads Authority information centre at Toadhole cottage is open, where you can see how marshmen lived in the 1800s. The renowned How Hill secret gardens will be open every weekend from the end of May through to October. The floating NWT Broads Wildlife Centre at Ranworth Broad (19.5 miles). NWT Hickling Broad (19.5 miles) is the largest of the Broads, a year-round haven for wildlife. NWT Upton Broad and Marshes (23 miles). 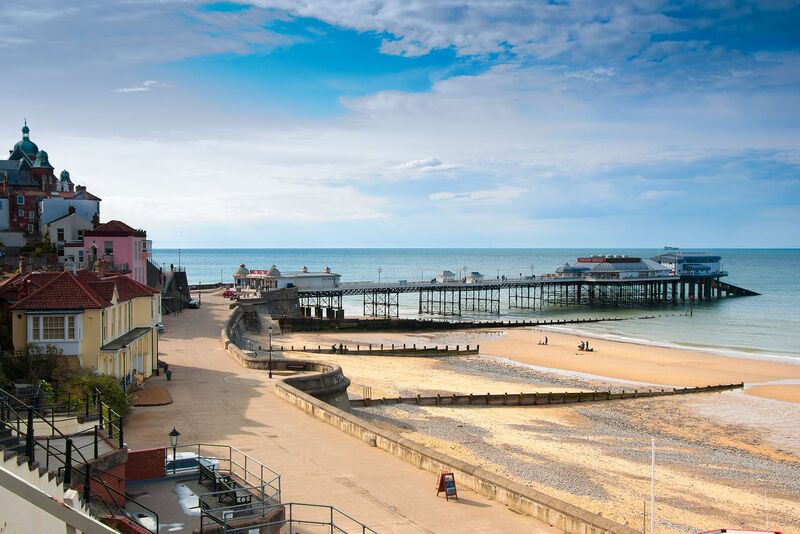 CROMER (8.5 miles) is a Victorian seaside town with fine sandy beaches. It is famous for crab fishing and has the only end-of-the-pier show in England. OVERSTRAND (8.5 miles) is an attractive village, situated on a cliff-top overlooking fine sandy quiet beaches. The lovely cliff-top path linking Cromer with Overstrand (about 1.5 miles) is one of the best walks in Norfolk. SHERINGHAM (11 miles) is a traditional seaside town with a pebbly beach which is sandy when the tide is out holding the European Blue Flag award for cleanliness. It’s great here for crabbing and there’s a good children’s playground as well. Sheringham has a popular twice weekly market on Wednesday and Saturday and many interesting shops, pubs, restaurants and tea rooms. Sheringham is home of the North Norfolk Railway (the Poppy Line), which operates steam train rides to Holt. Other attractions include the surrounding woods of Upper Sheringham, including Sheringham Park (National Trust). MUNDESLEY village (11 miles) has all the amenities and charm of a popular seaside resort. The beach is considered one of Norfolk’s finest beaches, long and sandy with safe swimming at low tide. Nearby Stow Mill is one of the best windmills in Norfolk and well worth a visit. WEYBOURNE (11.5 miles) is a pretty village with a shop and pub. The quiet rural beach is half a mile from the village. HAPPISBURGH (14 miles) has a wonderful sandy and quite secluded beach, the oldest working lighthouse in Britain and the Happisburgh Owl Barn which is open at weekends from Easter through to October. CLEY NEXT THE SEA (14 miles) is a picturesque village, well known for its Windmill and its magnificent church. Cley is also home to the NWT Cley Marshes Nature Reserve, internationally reputed as a premier birdwatching site. Cley does have a beach, which is mainly shingle and is accessed by walking over the marshes. BLAKENEY (15 miles) is an enchanting village, part of the Blakeney National Nature Reserve (National Trust). Daily seal-watching trips from early February to the beginning of November depart from the Blakeney Quay to picturesque Blakeney Point. MORSTON (16 miles). Morston Quay is part of the the Blakeney National Nature Reserve (National Trust). Daily seal-watching trips from early February to the beginning of November depart from the Quay to picturesque Blakeney Point. STIFFKEY (18 miles) is a pretty conservation village, a great base for walks on the salt marshes and coastal path. Forming part of the Blakeney Point National Nature Reserve, the Stiffkey Salt Marshes create an extensive habitat for a wide range of birds and plant life. SEA PALLING‘s main attraction is the beach (20.5 miles) which has retained the prestigious Blue Flag in 2016. WAXHAM (20 miles) has one of the few beaches that not many people know about, unless you are a local or a regular visitor. WELLS-NEXT-THE-SEA (22 miles) harbour town has a maze of narrow streets, old alleys and yards filled with shops, pubs and cafes. A narrow-gauge railway runs from the town to the long sweeping beach about a mile away, bordered by pine woodland. It is a magnet for bird watching with its marshes providing the perfect habitat. The Wells and Walsingham Light Railway runs to the picturesque shrine village of Walsingham. HORSEY (23 miles) is unique in that it’s a remote coastal village which is on the Broads. The National Trust-owned Horsey Windpump has a top deck from which you can gaze out across Horsey Mere. There are riverboat trips and the Mere itself can be easily walked around. Horsey has an unspoilt and beautifully quiet sandy beach, very popular for seal watching in the winter months. HOLKHAM (24 miles) is a small village with a beautiful beach, which is part of a National Nature Reserve and managed by Natural England in partnership with the Holkham Estate. Holkham Hall, a Palladian style mansion is set in large parkland, full of nature trails and marked walks. The beach always feels deserted and, if you are lucky, you may see the Household Cavalry there during the summer while the horses are on their holidays. Just perfect. WINTERTON-ON-SEA (26.5 miles) is a lovely unspoilt ancient coastal village, with pretty cottages, a lovely 300 year old pub and a cathedral sized church. There are miles of beaches and sand dunes which are a nature reserve classified as an Area of Outstanding Natural Beauty and is ideal for bird watchers and walkers. A colony of grey seals live just north of Winterton which can be regularly seen basking on the beach or popping their heads above the waves. CAISTER-ON-SEA (28 miles) is a large village with plenty of amenities. It’s main attraction is its wide, sandy, unspoilt beach with grassy dunes. Other attractions include Caister Castle Motor Museum and Caister Roman Fort (English Heritage). AYLSHAM (3.5 miles) is a charming market town with two markets each week and a fortnightly Farmers’ Market, good shopping facilities, pubs and restaurants. 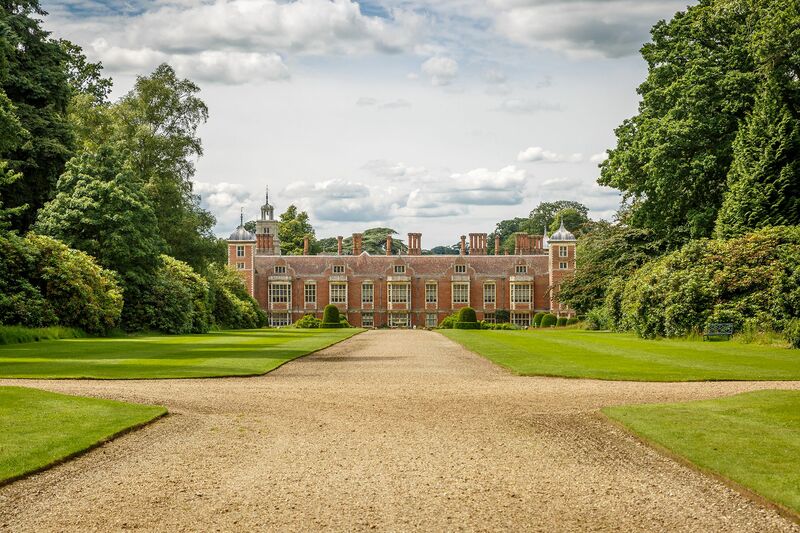 Attractions include National Trust’s Blickling Hall with its beautiful gardens and large estate and international programme of open air concerts. Take the Bure Valley Railway, a lovely little railway to Wroxham and the Broads, where you can spend a few hours on the water before returning by train. NORTH WALSHAM (7.5 miles) boasts a popular weekly market along with a monthly farmers market in the Market Place, an abundance of local shops with a good range of supermarkets, pubs, restaurants and cafes. Explore the town and combine with a walk in Bacton Woods, just outside the town, great for a woodland walk or for mountain biking. HOLT (10 miles) is a lovely rural Georgian town with plenty of unusual shops pubs, cafes and galleries to enjoy. Make sure you have tea at Byfords and leave enough time to look around the numerous antique shops and boutiques. Holt Country Park is just to the south of Holt and the North Norfolk Railway (the Poppy Line) runs from Holt station to Kelling Heath or Sheringham. WROXHAM (14.5 miles) is the capital of the Norfolk Broads. Boats of all kinds are for hire and there are also an abundance of hotels, pubs, restaurants, shops and a large department store. Wroxham contains many visitor attractions including a riverside park, the Bure Valley Railway, Hoveton Hall Gardens and Wroxham Barns leisure and shopping complex with boutiques, craft studios, a kids’ farm, funfair and restaurant. NORWICH (16.5 miles) city centre is easy to walk around and has a river at its heart. It has superb shopping, lively restaurants, bars and nightlife and a heritage that is a delight to explore. Its landmarks include the majestic Norman Cathedral, the domineering Castle and City Hall’s clock tower. Art lovers should make their way to the Sainsbury Centre. 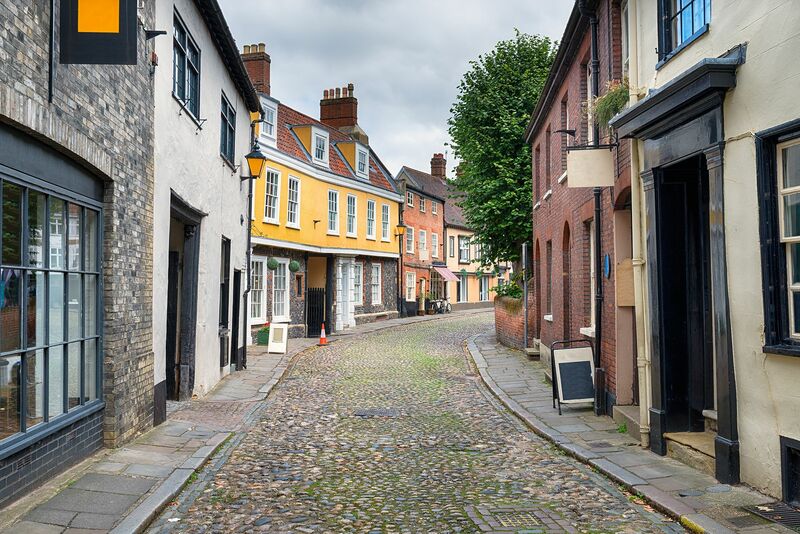 The city has the largest undercover market in Europe, Norwich Market as well as many museums and theatres, ancient pubs, cobbled streets such as Elm Hill, great historic buildings and half-timbered houses. The City of Norwich Aviation Museum (12 miles) is located outside the city centre with parking facilities. LITTLE WALSINGHAM (19 miles) a beautiful and historic village, famed for its religious shrines in honour of the Virgin Mary and as a major pilgrimage centre. The medieval village has various tea shops, cafes, restaurants, food pubs, art galleries, antique shops and a handmade chocolate and ice cream shop. An abundance of scenic walks include the 20 acre grounds at Walsingham Abbey. A scenic trip on the Wells and Walsingham Light Railway will take you to Wells-next-the-Sea. FAKENHAM (20 miles) is an historic and attractive market town (market on Thursdays). The famous Fakenham Racecourse is located just on the edge of town. Other attractions include Pensthorpe Waterfowl Park (host to BBC’s Springwatch) with its 500 acres of nature trails, The The Thursford Collection (boasting steam engines, fairground carousels and the largest Christmas Spectacular Show in England), Langham Glass and the unique Museum of Gas and Local History. RANWORTH (20.5 miles) is a lovely Broadland village with a beautiful medieval Church. Ranworth also contains the floating NWT Broads Wildlife Centre. BURNHAM MARKET (27 miles) is a pretty market town with a traditional village green. Known as “Chelsea-on-sea”, Burnham Market is a shopper’s paradise with its clothing and home boutiques, galleries, book shop, deli, bakery, fishmonger, butcher and tea shops. Blickling Hall, Gardens and Park (4 miles) is in the care of the National Trust. This wonderful Jacobean Mansion and gardens boasts former inhabitants including Anne Boleyn, who is said to still haunt the grounds in her carriage. There are beautiful formal gardens as well as stunning parkland which is free to all members of the public. Bicycles can be hired for use in the park and this includes children’s and baby carrying vehicles. There is always an interesting diary of events throughout the summer both in the house and gardens. Check the website for details on their full events programme. Felbrigg Hall, Gardens and Estate (8 miles) is one of the finest 17th-century country houses in East Anglia, in the care of the National Trust, with stunning gardens. Sheringham Park (National Trust), Sheringham (8.5 miles). East Ruston Old Vicarage Gardens, East Ruston (14 miles). Hoveton Hall Gardens, Hoveton Hall Estate, Hoveton Hall, Hoveton (15 miles). Fairhaven Woodland and Water Garden, South Walsham (21 miles). Holkham Hall and Estate (24 miles) has fabulous parkland. Thrigby Hall Wildlife Gardens, Thrigby (26 miles). Houghton Hall (28.5 miles) is a great house with wonderful gardens. It also hosts the Houghton International Horse Trials. Lexham Hall (29 miles), just north of Swaffham. Open periodically through the NGS. The Muckleburgh Military Collection, Weybourne (12 miles). Barton House Railway, Wroxham (14.5 miles). Ride on two miniature railways, 3 ½ inch and 7 ¼ inch gauge, in the garden of Barton House, operating both steam and electric locomotives. Clay Pigeon Shooting at Mid Norfolk Shooting Ground in Taverham (14.5 miles). Binham Priory (English Heritage), Binham (1 miles) is a ruined Benedictine priory. Gressenhall Farm & Workhouse, Gressenhall (23 miles). Banham Zoo (35.5 miles) has over 2000 animals in almost 50 acres of parks and gardens. 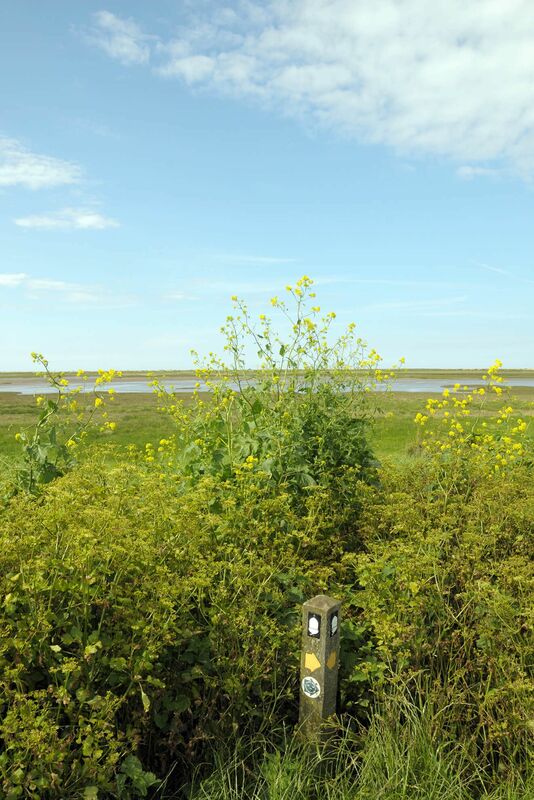 Situated on the Weavers’ Way footpath, the area is perfect for walking and birdwatching. Walk on the Weavers’ Way from Erpingham to Blickling Hall, as well as coastal paths for bracing walks. Surrounded by lovely countryside with footpaths and quiet lanes, there are great cycle routes on the doorstep. Cycle hire is available from the property owners as well as secure cycle storage. Royal Cromer Golf Club, Cromer (8 miles). One of Norfolk’s finest courses with spectacular cliff-top views and all the challenging features of a great coastal course. Sheringham Golf Club, Sheringham (9.5 miles). Mundesley Golf Club, Mundesley (10.5 miles). A variety of good restaurants and country pubs are located close by including The Erpingham Arms with its real ale (0.2 miles) which is a 3 minute walk. The Saracen’s Head, Wolterton (1.5 miles, 5 minutes’ drive) . Newly revamped, this is a super place to eat and has a very good reputation. The Banningham Crown, Banningham (2.8 miles, 6 minutes’ drive) offers fine ales and good quality food. If you are very lucky, your stay will coincide with one of their Jazz events or Morris Dancers who perform in the road outside! Aylsham (3.5 miles) and North Walsham (7.5 miles) offer a good selection of pubs, restaurants and take aways. Gate of India, Aylsham (3.5 miles, 9 minutes’ drive). If you can’t survive your stay without a curry, this is the restaurant for you. It has a very good reputation locally and provides a take away service, but no delivery. The Buckinghamshire Arms (3.8 miles, 10 minutes’ drive), is a very family friendly pub with a great reputation, situated at the gates of Blickling Hall. Roughton Fish Shop (4.8 miles, 9 minutes’ drive). When you’re by the seaside, you have to have fish and chips! Eat in or take away although we always think they taste better out of paper than on plate! The Walpole Arms, Itteringham (4 miles, 12 minutes’ drive). The Gunton Arms, Thorpe Market is 9/50 in The Times’ 50 Best Pubs (6.5 miles, 15 minutes’ drive). A traditional pub in the historic deer park of Gunton Hall. No expense has been spared on the interiors which boast works by Damien Hirst amongst others. Stuart Tattersall is the ex head chef at the Mark Hix restaurant in London and has been receiving rave reviews. However, the food is still sensibly priced and it’s an experience not to be missed. The Wiveton Bell, Wiveton (14 miles). Morston Hall, Morston, Holt (16.5 miles). If you’re looking for a special meal, this Michelin Star awarded restaurant is the place to go. You need to book beforehand because it is always full and there is only one sitting each evening. The meal is set menu and varies depending upon what good seasonal produce is available that day. If you are a vegetarian or a lover of the sea food, you can easily be catered for. The food is fabulous. The Globe Inn at Wells-next-the-Sea (21.5 miles). The Victoria, Holkham is 10/50 in The Times’ 50 Best Pubs (23 miles). The Hoste Arms, Burham Market (27.5 miles). Mothering Sunday Walk, Fairhaven Woodland and Water Garden, South Walsham (21 miles). Deepdale Spring Market, Burnham Deepdale (29 miles). Easter on the Pier, Cromer Pier (8.5 miles). FREE event. Bluebell Weeks, Fairhaven Woodland and Water Garden, South Walsham (21 miles). Folk On The Pier, Pavilion Theatre and across the town, Cromer (8.5 miles). Cromer & Sheringham Crab & Lobster Festival, Cromer & Sheringham (8.5 miles & 11 miles). Houghton International Horse Trials, Houghton Hall (28.5 miles). Cromer Pier Show 1, Cromer (8.5 miles). Green Festival and Boat Show, Fairhaven Woodland and Water Garden, South Walsham (21 miles). Jazz and more in July, Fairhaven Woodland and Water Garden, South Walsham (21 miles) – every Sunday in July. Cromer Pier Show 2, Cromer (8.5 miles). Shakespeare Festival in the Cloisters, surroundings of the Norwich Cathedral cloisters. Pack a picnic or order one from the Refectory (16.5 miles). Winterton Scarecrow Festival, Winterton-on-Sea (26.5 miles). Holt Festival, Holt (10 miles). Worstead Festival, Worstead (11 miles). Heavy horses and tractors, with fun for the kids, craft stalls, and the best of Norfolk food. Cromer Pier Show 2, Cromer (8.5miles). North Norfolk Music Festival, St Mary’s Church, South Creake and Holkham Hall (23 & 24 miles). Wells Pirate Festival, Wells-next-the-Sea (21.5 miles). A three day festival with fun events. North Norfolk Food and Drink Festival at Holkham Hall (24 miles). Aylsham Food Festival, Aylsham (3.5 miles). Cromer and Sheringham Art and Literary Festival, Cromer & Sheringham (8.5 miles & 11 miles). Norwich Beer Festival, St Andrews and Blackfriars Halls, Norwich (16.5 miles). Halloween at Holkham Hall (24 miles). Halloween Open Day, Cromer Pier (8.5 miles). FREE event. Thursford Christmas Spectacular, The Thursford Collection, Fakenham (15.5 miles). The largest Christmas show in the country! Christmas Country Craft Market, The Forum, Norwich (16.5 miles). Cromer Christmas Show, Cromer Pier (8.5 miles). Assembly House Christmas Fair, The Assembly House, Theatre Street, Norwich (16.5 miles). Meet Father Christmas, Cromer Pier (8.5 miles). Clutter City Yuletide Market, Norwich Arts Centre, Norwich (16.5 miles). Norwich Global Village Christmas Market, St Thomas’ Church Hall, Norwich (16.5 miles). An audience with Father Christmas, Holkham Hall (24 miles).